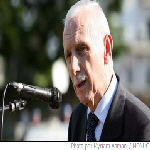 At the farewell ceremony on November 23 2006 for the Uruguayan contingent that are now finishing their nine month tour in the DRC, William Swing, the UN Special Representative in the DRC, spoke on the current political situation in the DRC. 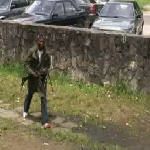 Residents of Kinshasa, capital of the Democratic Republic of Congo, have largely remained indoors and fearful after President Joseph Kabila requested that his rival Jean-Pierre Bemba withdraw some of his personal guards from the city by Friday. 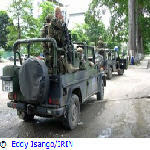 The "uncontrolled" elements of the militia of the defeated presidential candidate Jean-Pierre Bemba, a former rebel leader, must be "neutralized": as stated by Interior Minister Denis Kalume, while President Joseph Kabila - confirmed provisionally after victory in the runoff - gave his rival 48 hours to move his personal guards out of Kinshasa. 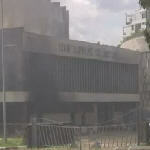 The offices of the Supreme Court of the Democratic Republic of Congo, partly damaged by fire, will be relocated to different parts of the capital, Kinshasa, or elsewhere in the country, Vice-President Azarias Ruberwa said on Wednesday after inspecting the facility. 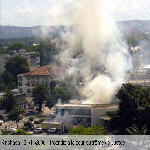 The DRC Supreme Court was engulfed in flames today November 21, 2006 following a protest as the Court began a public hearing into the election contestations of defeated presidential candidate Jean Pierre Bemba. 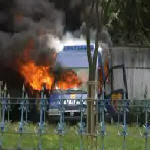 U.N. peacekeepers and firefighters in the Democratic Republic of Congo have rushed to the Supreme Court to contain violence after clashes and a fire broke out. 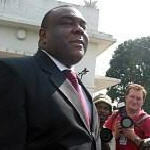 The court is considering a complaint of fraud by the apparent loser in the Oct. 29 presidential election, former rebel leader Jean-Pierre Bemba. 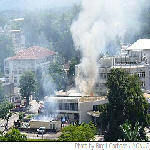 During the confrontations of November 11, 2006, in front of the residence of vice-president J.P. Bemba, the Uruguayan corporal Correa of MONUC, showed courage and devotion while saving the life of a woman and her four children. Democratic Republic of Congo (DRC) Vice President Jean-Pierre Bemba has filed a legal challenge to the results of last month's presidential runoff election won by incumbent President Joseph Kabila. 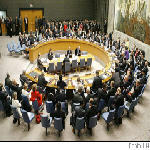 17 November 2006 - The Security Council today added its voice to the chorus of United Nations calls for the two candidates and their supporters in the run-off presidential election in the Democratic Republic of the Congo (DRC) to avoid acts of violence after the release of provisional results and to use the law only to settle any challenges.